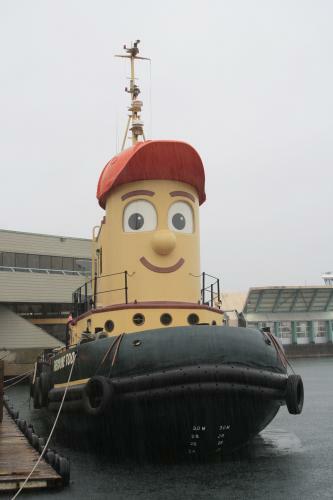 Theodore Tugboat began in 1989, created by Cochran Entertainment, with master model maker Fred Allen, as a children's television series inspired by the Halifax Waterfront and the stories Andrew Cochran would tell his son at bedtime. The stories tell the adventures of Theodore and his many friends in the Big Harbour, where all the boats have their own personality and role in the Harbour community. 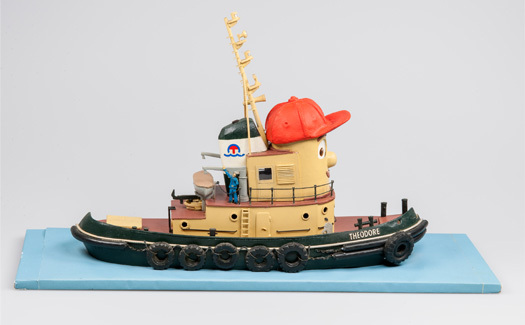 The Museum continues to present this popular exhibit, based on the actual models and sets used in the Theodore Tugboat television series. Young visitors can meet their favourite characters and see the Big Harbour. Altogether, more than 20 models are on display, including Theodore, Digby the Cable Ship and Barrington Barge. An exciting and entertaining experience for children and adults alike, the exhibit helps to explain how a busy harbour works. 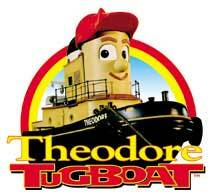 A working replica of Theodore, named "Theodore Too" was built in Dayspring, Nova Scotia. Designed by Fred Allen and Marius Lengkeek, the tug was launched on April 19, 2000 at the Snyder Shipyard. After a successful tour of several North America ports, she now makes her home here in Halifax as part of the fleet of touring vessels owned by Murphy's on the Water.